Moonflowers, Magnolias, and General "Madness!" 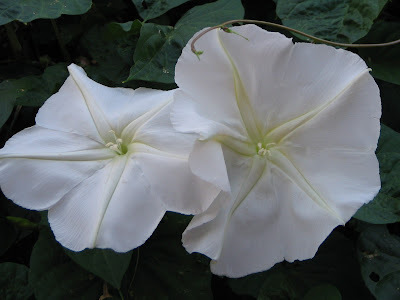 Did I tell you about my moonflowers? Several years ago my mother - who is a fabulous gardener! - sent me a packet of moonflower seeds for my birthday. I planted those little buggers and - voila! I soon had a huge climbing vine which had these lovely white flowers at night. That is right - they flower at night. Hence the name MOON flower. Anyway - the moonflower is blooming its little heart out right now. I have continued planting them every year because they are one of the things I have found which do well in my neck of the woods and which I can keep alive. This morning when I glanced out the window I saw six blooms on my side of the fence. On my way back from walking I noticed another two blooms (closed up and spent by that time) on the other side of the fence. Today I am having lunch with an ex-coworker from my last school. She is the librarian and is a wonderful person and a super friend. Unfortunately, I haven't seen too much of her since I left my school for medical leave and the whole SD adventure. SD can be really isolating and I know that I have neglected several good friendships due to the fact that talking was/is a struggle. Now I am slowly working on getting those friendships back on track. Of course, THEY could have contacted me! But - I am sure that they didn't know what to say about the whole not talking thing. Oh well! We are eating at The Magnolia Cafe. Doesn't that sound like a nice place to eat lunch. According to my friend it is a nice, "girly" place to have lunch and they have good desserts. Now, that is MY kind of cafe! Today was my second day of walking with "C." I dragged myself from my heavenly bed in which I had slept like a log for once (probably because I was so tired from not sleeping the previous night and from working!!!) and made it to the meeting place. However, while I was there and was stretching a bit I saw someone coming down the sidewalk toward me. Could it be? Yes! It was my neighbor "Mrs. N!" This is the neighbor who used to walk with me but quit because it was too hot. Imagine my surprise! I had discovered the "C" was friends with "Mrs. N" and we had discussed getting "Mrs. N" to walk with us. I hadn't had time to talk to Mrs. N (The quotations are just too tedious to do every time - so please excuse me!) yet due to my WORKING and all. Apparently, C had called Mrs. N and told her to get herself out of bed in the morning to walk with us. It worked! The three of us had a good walk (and a good sweat) and plan on doing it every morning for a while! Yeah us! Voice Update: After working for six hours yesterday my voice is a bit tired. It is still doing pretty well in terms of what it sounds like but I just don't feel like talking all that much. Should make lunch interesting! All of the other speech therapists in the office were very impressed with my voice. AND I did a fair amount of phone work yesterday with little trouble. I did have problems saying the end of tomorrow. Hmmmmm. My therapist told me I was talking too loudly at one point and when I lowered the volume - the word tomorrow came out so much easier! I hate it when she is right! Well, I am back from the first day of walking with "C." It was . . . okay. She was a bit late - almost 10 minutes - which was a little annoying but, I spent the time walking up and down the road in front of where we were going to meet. She did have one of her granddaughters with her - a nine year old - who was actually a very nice kiddo. She and her family have just moved back to Texas from Connecticut and she said that she was glad to be back. GLAD? To be back to THIS HEAT?? Is the girl nuts???? Anyway - the walk was good even though it was very HOT and humid this morning. We walked all over the place - longer than my normal route but not too bad overall. I had fun watching the granddaughter look for sprinklers to run through. Then - wait for it . . . it started to sprinkle! Yes! It actually started to sprinkle water from the sky! In Texas. In the summer! I know - hard to believe, right??? Well, it didn't rain very hard and the rain that did fall evaporated quickly from the sidewalks. The clouds were still very black when I came into the house but . . . I won't hold my breath! I did water my flowerbed this morning so maybe that will be enough to tempt the rain from those clouds! Okay - on a totally different topic, I have noticed that someone from Dallas keeps showing up on my blog. Of course, this person doesn't leave a comment. Please Dallas person - leave me a comment. I am interested in knowing where exactly in Dallas you are! It is nice to know that someone from my area is reading my blog! Also - if anyone reading this blog knows the person from Seward, Alaska who visited my blog a while back, please let that person know that I did catch my mistake and did actually post about Seward later. I feel bad that when the Seward person showed up I had mistakenly identified pictures from Kodiak as being from Seward. I don't want them to think I am "dissing" their neck of the country! Voice Update: A bit rocky today. Probably due to a lack of good sleep. I just couldn't get to sleep last night! I will do some exercises before heading to the speech therapist's office to work. 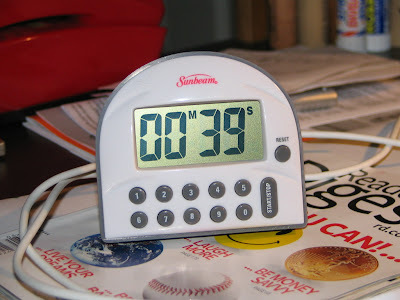 Maybe I will take along my buddy the timer to continue exercises while I am there. It would be good advertising! I have recorded my podcast on massage - now I only need to edit it and get it posted. Keep an eye out. It should be out this week! Have I mentioned that it is HOT here?? I just got back from walking and plopped myself down in front of the computer, and under the ceiling fan, sweating like a pig. Except pigs don't really sweat, do they? Anyway - it is HOT here. Oh . . . wait. I already said that, didn't I? Yes? It is just that I am currently IMing with my mother who says it is "almost too cool to sit outside" at her house. Must be nice! While walking today I met another walker and we decided to combine our efforts and to walk together. We are going to give this a try tomorrow for the first time. It has been a long time since I have walked with someone in the morning (my neighbor used to walk a couple of years ago). I have mixed feelings. First of all, this means that I will have no excuse for not walking each morning. I will have to haul myself out of bed no matter how lazy I feel. I will have to actually have to try to be semi-awake during the walking process. I won't be able to listen to all of my podcasts - that would be rude, right? Next, what if this woman, who I met just this morning and talked to for about fifteen minutes, isn't someone I really want to spend much time with? Every morning might be a BIG commitment to a person I don't like! Sure, she seemed nice enough this morning . . . Finally, I will actually have to haul myself out of bed EVERY DAY no matter how lazy I feel. Wait . . . that sounds familiar! Oh well - I guess time will tell! Yesterday I got another call from my speech therapist. I am going to work for her tomorrow afternoon! Yeah! That means more money (I am NOT materialistic but it does feel good to be earning money after over a year of being off work due to my darn voice!) and more interesting stuff to do. Okay - it might not be that interesting but, it will let me feel like I am being useful again! Yes, I admit that I haven't felt really useful for a while. It is funny how that happens. In the fall of 2006 I was a happy, working woman. Okay - so I didn't have a voice and that made me less than happy. Anyway - I was working. I was teaching and making a difference. Then, the voice thing really hit hard. I took a short leave of absence which turned into the rest of the school year. Then it morphed into the whole next year. It was during the "rest of the school year" that I began feeling like I wasn't useful. I mean, not too many people stay home who don't have children. It was weird to be home during the day without stacks of papers to grade or lessons to plan. Most of my friends work so they were not around to do stuff during the day. The one friend who doesn't work has two small children to keep her busy - even though we do meet once a month for lunch. Okay - enough dwelling on this. The important thing is - I am working tomorrow. Yep. Working and earning some money! Of course, that is AFTER I drag my lazy rear out of bed to walk in the morning! Voice Update: Good. Of course, it did have some "breaking" when I was on the phone with my speech therapist - figures! I didn't do my exercises yesterday (bad, bad, bad!!) because I was busy being lazy. Today it is back on the horse. After all, I have to go work with my speech therapist tomorrow and she will know. 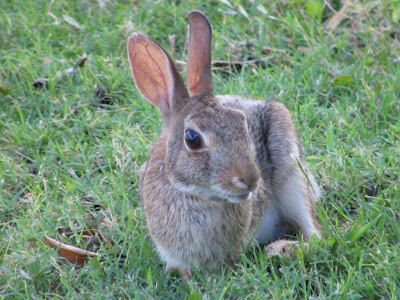 This little bugger has been hanging out in my neighbor's front yard. I am pretty sure that there is a whole family of bunnies living in his bushes. Is there anyone who can look at these little things and not smile! They are so cute! This guy made my whole morning! Voice Update: My voice is still sounding as close to "normal" as I think it will ever get! I am working hard on those unvoiced consonants. I have to be honest - all of these exercises are getting a bit boring . . . I have to figure out a way to make them more entertaining! 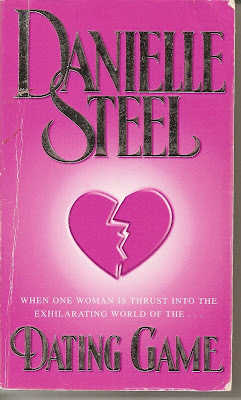 This post is a weird tribute to my mother who can never remember Danielle Steel's name when we are in a book store and then resorts to calling her "that woman who writes all the books." Needless to say, we don't get very far with that description! Anyway, I just finished Dating Game by Danielle Steel. It is a very good book about a wife and mother who, after twenty-four years of marriage, finds herself single (due to a divorce), alone (one child is on her own, the other is in college), and facing so many changes she doesn't know what to do. With some well timed guidance from a counselor this woman, Paris, enters the unknown world of life on her own. She moves and finds a new job and has some pretty hairy experiences with the dating scene. I always enjoy Danielle Steel's books because she has a way of making the characters so real that you soon feel as though they are your best friends. I found myself really connecting to Paris while she traveled this new road in her life. I felt her triumphs (there are many) and her pain (also many) and even started to really dislike her ex-husband (who I concluded was a real jerk to leave her!). This book examines life after marriage for middle aged adults and is filled with tenderness and hope. It is also extremely readable and a good book for the beach, the plane, or just for relaxing at home. I highly recommend it. Voice Update: Still goin' strong. I am in the midst of my lovely "e's" as we speak and Hubby is having fun mimicking me from the living room. I do find myself getting really, really dry after my exercises. I guess it is because when doing inhale work, the air rushing past the mouth and vocal chords is the dry, outside air instead of air moistened by the lungs. Good thing I always have plenty of water on hand (thanks, Hubby!). Well, yesterday I went in to my speech therapist's office - not for another speech session but to help her out while her secretary is out. I worked for about five hours and did all kinds of things. I worked on the computer. I filed stuff. I got things ready to mail. I got a deposit together to put in the bank. I figured out how to print stuff on letterhead without having it print upside down or run into the letterhead. I even mastered the copy machine - sort of. The thing that I am most proud of, however, was that I actually called all of my therapist's patients to remind them of their appointment on Monday. Okay - not ALL of the patients - just the ones coming in on Monday. Anyway. The point is - I CALLED the patients. On the PHONE. And they understood me and everything! Sure, that might not seem like a big thing but, if you have been reading my blog for a while, you know that I have SD. You might also know that talking on the phone is a BIG, HUGE, HONKING DEAL for people with SD. It just isn't fun and usually provokes terror. Okay - maybe it provokes anxiety. 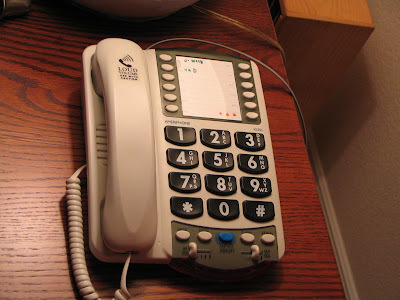 I have posted before about my amplified phone and how it helped me get up the nerve to talk on the phone again. Well, the phone I used in my therapist's office was NOT amplified. Despite some twinges of anxiety in the bottom of my stomach, I picked up that phone and made those calls. I am proud of myself and have proved to myself that I can do it! Voice Update: Well, I talked a lot yesterday while working and so my voice is a bit tired today but it is still amazingly good. I am still on track with my exercises and massage (even though I will admit that at the moment I am working timer free). The exercises to help with the unvoiced consonants really seem to be working. Either that or I am convincing myself that they are working! I just came back from my morning walk. The sun was shining, the birds were singing, the sprinklers were sprinkling, the landscapers were mowing and edging and blowing, people were jogging, the sweat was flowing . . . Yes, it was a beautiful day! I always enjoy my morning walk served with soggy shorts and a soaked shirt. It really makes me look even lovelier than usual! As the summer has progressed, it has become harder and harder for me to get myself out that door and into the Texas heat to take my daily trek around the neighborhood. I mean, when it is already 80 with 40% humidity at 7:30 in the morning . . . you know it is just going to get hotter! When it was in that transitional period between winter and summer (yes, I know most people call it Spring but we don't get a true Spring here most years - it is only a week or so and I think it is a travesty to call that Spring! ), I dutifully check the thermometer prior to my excursion to make sure I am dressed appropriately. However, when summer has come to stay, I know that is just going to make it more difficult for me to get out the door. I don't think anyone really wants to take a walk when it is 80 or above and is only going to keep heating up during the walk! I try to keep my mind off of the inevitable sweating by listening to my faithful iPod. I have all kinds of things to listen to, Agatha Christie radio plays, family podcasts, word of the day podcasts, stories. Things are find and dandy and I enjoy the entertainment as well as the surrounding environment. Until the sweat starts dripping. Yes, I said dripping! The film of sweat on my face I can ignore. The dampness under my arms and around my waistband - nothing. However, when the sweat starts dripping from my hairline onto my neck - I can't ignore that! It is at that point that I start using my shirt as a towel. I mop the sweat off my neck and my nose with the sleeves of my shirt - probably the only dry part of the shirt left by this time. Yes, I know it isn't very ladylike but come on! Sweat dripping is just not cool! As I walk along dripping and wiping, all I can think of is . . . It was like this only about five months ago! Voice Update: My voice is excellent! Still working on those exercises - it is such fun when Hubby "e's" along with me! NOT! I am working on words starting with those unvoiced consonants (such as heave) to try to work on an alternate way to get them to sound. I concentrate on saying "eave" and then, at the last minute, tack on an "h" sound. It seems to work but it does take a while to figure out this technique! Have I mentioned how much I "LOVE" my timer? Look at this nice shiny award I got from Asthma Girl! Isnt' it nice? It is my second award and I am thrilled. Of course it has taken me a while to get it on my blog . . . I am slow that way! Okay - speech update. I had speech yesterday and my therapist was beside herself with how good my voice was doing. All of that exercising with my friend the timer has really paid off! Also, my larynx was looser than it has ever been - thanks to all of that massaging! YEAH ME! I did talk to her about my continuing problems with those darn unvoiced consonants and she gave me some exercises to do which will hopefully help. It is sort of tricking my vocal chords into saying the sounds by letting them think we are skipping the sounds and moving on with the rest of the words. Confusing? That is what I thought when I first heard what I was supposed to do. Here is the basic plan. Take a word like "heave." Instead of trying to start off with that vexing "h" sound - I try to start off saying "eave" first and then sort of sneak that "h" onto the front. It isn't too easy for me right now but I am working on it. I have a list of words to practice. Fun, fun! MORE stuff to practice! Oh well, it will all help me in the end, right? Oh - did I mention that my therapist offerred me a part time, temporary job doing some medical billing for her? I have never done that before but am willing to give it a go. It will only be one or two days a week and hopefully not for long (okay - I will explain that in a minute). I think it will be nice to get out of the house and earn a little money! The explanation - the real secretary/receptionist who normally does the billing is in the hospital. She is a wonderful woman who happens to share my birthday. They had to operate to take a mass out of her lung and it may or may not be cancerous. I am hoping for the non so that she will be back to work in just a bit which would end my temporary job. Voice Update: See the post above - I won't bore you by repeating! 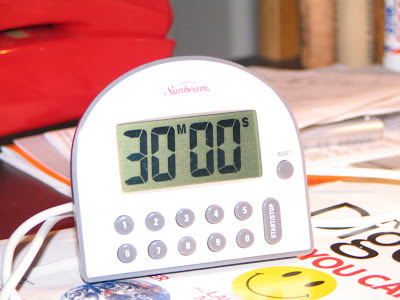 Joining me today (as it has for many days) is my friend, timer. It is so much fun to have my "friend" around reminding me to do my exercises. He also likes my blog so . . . 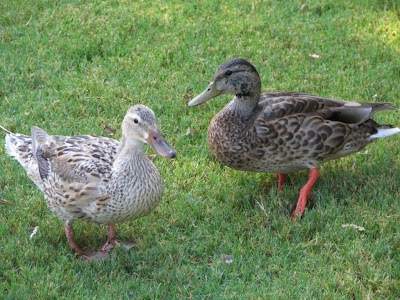 Okay - we live near a lake and have gotten used to seeing ducks and geese wandering around the neighborhood. We have even stopped asking ourselves "Why wouldn't they just fly one more block and be in the lake?" Okay - we still mutter that under our breath once in a while as we avoid duck poo on the sidewalk. We have a couple ducks which have been visiting us lately. Hubby has been feeding them bread (gee - I wonder why they hang around!) 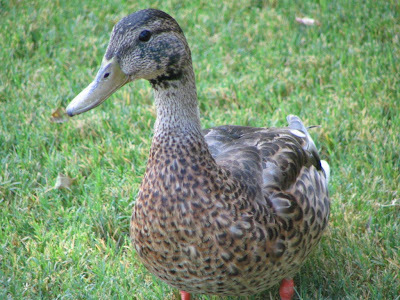 and we have fun trying to identify just what kind of ducks they are. Take a look. First of all - aren't they cute? I love the little swirly pattern on them. But . . . any clue what kind of duck they are? This blue patch on the one duck made me think it was a mallard but . . . when I checked the new bird book that my mother had given me for my birthday, it clearly stated that mallards have a neck band and a different colored head. Okay - that is a male. The females are a bit like this one. A bit . . . but not quite! My friend is still here faithfully counting down the minutes until my next exercises. Isn't he such a fun friend? 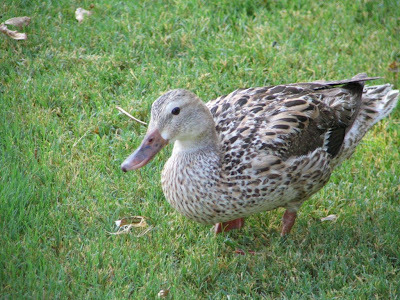 Here is the other duck. No neck band. Not even a patch of blue on the wing though there might be a hint of a patch but Hubby and I couldn't tell for sure. 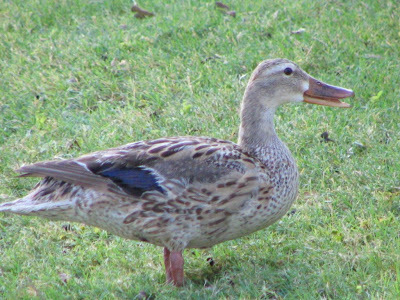 Maybe an immature mallard? And which is the male and which is the female? Oh - I think they have the wrong colored bill for Mallards too. Of course I don't have the book with me while I write this! That would be too easy! So - anyone out there who can identify these little buggers? Oops - according to my friend it is almost time for me to "e" my way through another session of exercises. Glad my bog is about written! Voice Update: My voice is still doing well. I didn't do nearly enough exercises yesterday because I couldn't sleep and then had ipod problems which kept me up even longer. Long story short(er) I was awake until 4:30A.M. and then slept until about noon. That makes it hard to do vocal exercises. Of course Hubby thinks that I have done them enough that I should be able to do them in my sleep. I am struggling with words starting with "p" a lot lately. I don't recall if I have always had problems with this particular sound or if this is newer. Oh - "h" and "w" words are still giving me trouble. I think I have speech today so we will see what happens. Just some random thoughts today. It seems like my mind is running too fast to settle on one topic so . . . here we go! Speaking of minds running too fast - my mind is ALWAYS going. I don't think I have ever spent any time just "vegging" with my mind blank. I talked to my brother the other day and he told me that he has moments where he just totally zones out and his mind is blank. I zone out - but I am always thinking of something. Just not what I should be thinking of at the time. Am I the only one who never has a "blank" moment? Is it normal to have times when you are just not thinking or is it normal to think ALL THE TIME? iPod earbud wires - why hasn't someone figured out a good way to control these little beasties? I have seen several products - and even bought one - but it seems like they don't work well enough or they kink the wires or I just don't use them. I HATE finding my earbud wires in a big tangle and I find them that way ALL the time. Does anyone have any suggestions? Grocery shopping - I have a love/hate relationship with this particular task. In some odd way I feel like grocery shopping is an accomplishment. I have gotten nutrition (okay - maybe not the BEST nutrition but nutrition none the less) for myself and for Hubby. We will survive for another week. However, I also hate grocery shopping. Passionately. There is nothing stimulating about pushing a wobbly-wheeled cart through a store full of people who stop in the middle of the aisles blocking the way with their cart and then who get angry when you push their cart aside enough to squeeze by. I hate walking by the dairy department and freezing. I hate leaving the air conditioned store to walk to my car in the Texan heat and then unloading the groceries at home in the same heat. I am reading my way through the Harry Potter series again - I am on the fifth book. Is it just me or does Harry start getting a really dark attitude in this book? He seems angry a lot and the whole "mood" of the book gets darker. I suppose it could be a reflection of his getting older and hitting the whole teen angst thing but . . . do you think J.K. Rowling might have been in a darker mood herself? AND - what is up with the thickness of the books? They get thicker as the series progresses. The first book is pretty slim comparatively speaking. Do the books get thicker as people get more interested in the story? Did she start out rather timidly and then, when she saw that people liked the first book, let her imagination run wild? Is slightly bigger text better for posting my blogs? Does anyone care if I finish the Mission Migraine story? 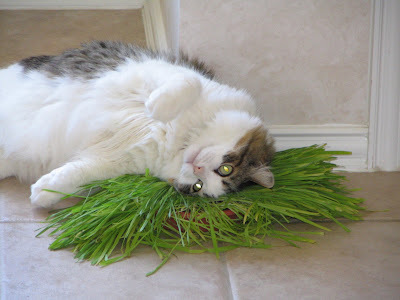 Why does Blogger insist on messing up my spacing in my blogs? Whenever I add a picture after I have already started typing I suddenly get HUGE spaces between paragraphs! What is up with that? 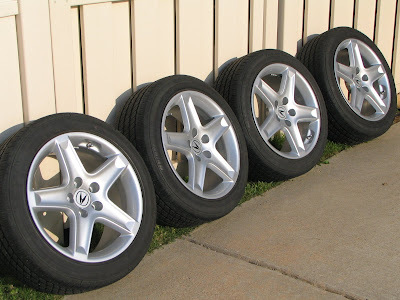 Does anyone want to buy these wheels for an Acura car which are cluttering up my garage? Voice Update: It is rockin' and rollin' right now. My voice sounds good. I am back in the swing with the timer and the exercises. 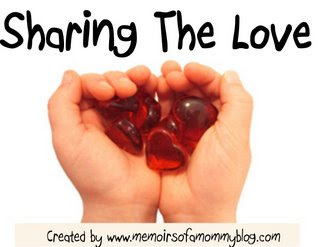 I "love" those things (not really!)! I am massaging my heart out - and I have used my percussion massager to relieve tension in my neck and shoulders. What a great invention. Well, I am on the computer and Hubby is still napping. That is what I like about Sundays, you can nap once in a while! Of course, we still have to mow the back yard and weed-whack it. That won't be fun in the Texas heat! I have been sleeping a bit better lately and I am convinced it is because of my blanket. Okay - it is too hot here to sleep under a blanket but, I have this satin blanket that my mother made for me when I was in high school - or college (I can't remember when exactly!). It is twin sized and is pink. Perfect! When I was little I loved my blankie with the satin edging on it. I would rub that satin as I fell asleep. Now I have my satin blanket in bed with me and I rub that satin as I fall asleep. It seems to work well. I wonder if it is childhood memories helping me sleep or long forgotten conditioning. Whatever it is I seem to be sleeping better. Odd, huh? 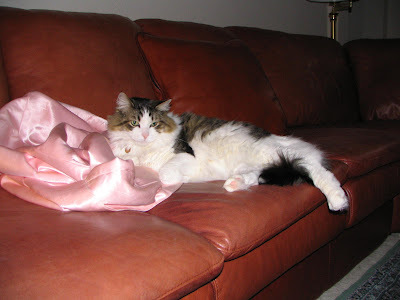 This is a picture of my pink satin blanket with my beloved Q-Tip. See - even he loved the thing. Thanks for making it for me, Mom! Voice Update: Well, I haven't actually talked too much yet today but I think things are going well. 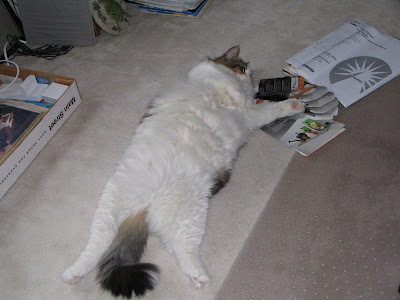 I didn't do many exercises yesterday (okay - I didn't do ANY) because I was just plain lazy. I am enthralled in my Harry Potter books. I promise I will get back to those darn things today. Well . . . maybe tomorrow! 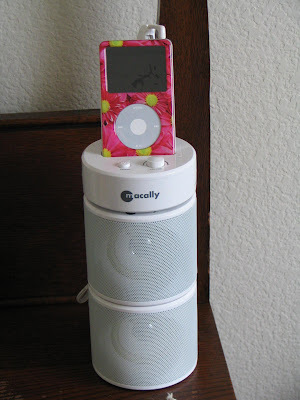 The addition of a nifty set of speakers lets me listen to my music without earbuds. Surprisingly, this little system (which also charges the iPod) is very powerful and when I am home alone I crank the volume to hear it throughout the house. What I really wanted to talk about today was using the iPod the way it was originally meant to be used - with the earbuds. These little things are neat - they just pop right into your ear and are pretty unobtrusive. I have even been known to fall asleep with them in while listening to my relaxing rain or ocean wave tracks. These earbuds are marked with an L and a R for left and right. Being the kind of person I am, I HAVE to put the correct earbud into the correct ear. I mean, who knows, it might really affect the quality of what I hear! However, it never fails that when I get those little things in my hands I have the left earbud in my right hand and the right earbud in my left hand. Every time! You would think that once in a while they would end up in the correct hands, wouldn't you? This drives me nuts! I spend about a minute or two untangling the earbud wires because they ALWAYS get tangled (unless I take the time to put them away in the neat case I made with the place to wind the cord). Then, I look at the earbuds and they are in the wrong hands. It is so annoying. Voice Update: Yesterday I met my brother and sister-in-law and their kiddos for lunch and my voice was very good. They hadn't heard me in person since last October so they were impressed. They could still hear little "misses" once in a while but on the whole they said that it almost sounded like I had a normal voice! I did my exercises like a good girl yesterday ( have I mentioned that I "Love" my timer????) and it seems to be paying off. Today is a special day in the life of Hubby and me (okay - I have been pondering this for a while - is that grammatically correct?). 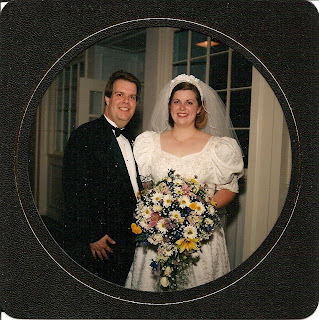 It is our eleventh anniversary! 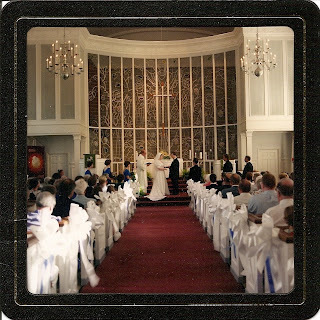 While it seems like just yesterday we were in this beautiful church getting married -on the hottest day of the year in an area where most churches are not air conditioned - and now, here we are eleven years later. Isn't the church beautiful? I love the screen up front which depicts Jesus and the four apostles. It is hard to see in this picture but I have spent many sermons pondering the beauty of that screen. The choir normally sat behind the screen which is where the organ is located. This is a real pipe organ with the pipes behind the screens to the left and right of the screen. Here we are fresh from our vows. Don't we look happy? I loved those flowers - they reminded me of spring. 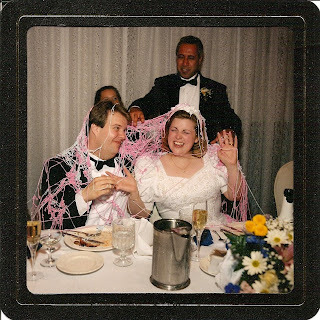 This is at the reception where Hubby and I got silly stringed by our wedding party. They very prudently blew out all the candles on the table before attacking. Wasn't that nice? I had that stuff down my dress and in my mouth - it doesn't taste too good! That is my husband's brother-in-law and niece trying to untangle us. Memories. They are so great! Luckily, the present is pretty wonderful too! Voice Update: Well, my timer went off just as I started writing this so I am "eeeing" my little heart out! Massage is up next. What fun. However, it does seem to be paying off. My voice is stronger than it was last weekend during the migraine fun and I only miss the occasional unvoiced consonant sound. 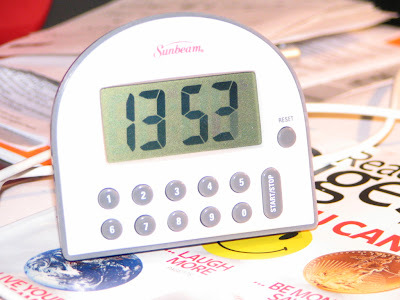 I must admit that I turn the timer off after dinner - I just can't face any more exercises by that time of day! If you have read my blog for any length of time you are hopefully aware of the fact that I have Spasmodic Dysphonia - a neurological disorder which makes speaking very difficult for me. If you have listened to any of my recent podcasts you are also aware of the fact that currently my voice is sounding pretty "normal." I thank God daily that my voice has progressed to the point where most people wouldn't notice that I have SD. I also thank my therapist and the TONS of work we have done together to get me to this point. However, no matter how good my voice sounds at any given time or how often people hear me and think I am "normal," I still have SD. Sometimes I conveniently "forget" about having SD - usually when I am trying to avoid my speech exercises! But - eventually, something comes up to remind me that yes, SD is incurable and I will be living with it for the rest of my life. This past week I have been reminded about my SD by the mere fact that my voice hasn't been as good as it was a few weeks ago. This is because of some stress in my life and some illness (migraines are tough on my voice). I have gotten back into my exercises religiously - the timer is counting down its thirty minute interval until the next session of exercises as I type this. My voice has improved. Life goes on. I didn't realize how much my friends have adjusted to my SD until yesterday. I have a wonderful friend, "D," who was a lifesaver for me during my "silent months" she would take the time to listen to me on the phone when it was virtually impossible to hear me unless she was in a quiet room and listened intently. She made a point of emailing me to see how I was doing. She even made a point of getting together with me for lunch or dinner about once a month or so. D's daughter, "C," is also very good with the whole SD thing despite the fact that she is only in the 8th grade. Anyway, D and C have always been there for me. C knew it was me on the phone when I called and she didn't really hear anyone. "Hi, Mrs. K!" she would say cheerfully. "I'll get my mom." They understood that when we went out to eat it was important for me to pick a quieter restaurant. They knew that my Spokeman microphone would be the not-so-silent fourth in most of our meals. C even offered to decorate my Spokeman with rhinestones and glitter at one point (I politely declined.). They are great. I had dinner with D and C last night. Now, it has been a while since I have had to take my Spokeman with me in order to be heard but we still choose quieter restaurants and C has even been known to politely ask that the music be turned down so that I could be heard. It has gotten to the point that this is natural and none of us really think about it anymore. Last night we ate at a restaurant where we don't normally eat, Macaroni Grill. It was a nice meal and we had a lot of fun talking and joking around. After the meal we headed to Half Price Books to troll the aisles for something interesting. It wasn't until I talked to Hubby that evening that I realized the accommodations we had made for my SD. I told him that we had gone out to eat - he wasn't surprised. But when I told him where we had eaten, there was a pause in the conversation. They he said, "Isn't that too noisy for you?" I realized that yes, it was a noisy place to eat. I also realized that without discussing it we had decided to eat rather early because there wouldn't be a big crowd in the restaurant and therefore the place wouldn't be too noisy. I also realized that when the host showed us to the table, all three of us looked around to see if we were being seated by anyone or anything that would make talking difficult for me. SD has become such a part of my life that these accommodations are now second nature for me as well as my friends. They are not even discussed because they are "normal." How wonderful to have such great friends! Voice Update: I have been faithful to my exercise routine and have noticed that my voice is responding well. I am still missing a few unvoiced consonants here and there but they are becoming fewer and farther between. I have been doing inhale "e's," "ee's," and "eee's" along with massage every thirty minutes. I have also been making an effort to do some reading aloud and some inhale/exhale matching pitches when I get a chance. I am doing some research on the massage for an upcoming podcast and blog entry. Sorry it is taking me so long but I don't want to give you bad information! Is there anything better than drifting off asleep to the sweet sound of raindrops on the roof and the distant rumble of thunder? I think not! Last night I had the treat of falling asleep (okay, I didn't really fall asleep but I was drowsy! It took me a while longer to fall asleep and by then the rain had stopped.) to the sounds of a Texas rain. 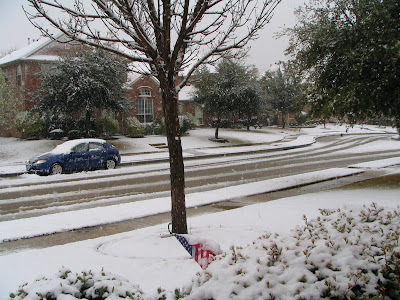 Normally, rain in Texas is a chaotic event. The rain comes down in heavy sheets in a pretty much horizontal direction. Umbrellas are an exercise in the futile because no umbrella can deal with the whipping winds which accompany a typical Texas downpour. Last night, however, was different. This was a gentle rain that slowly soaked the ground and basically played by the laws of nature by coming straight down from the sky. It rained for over an hour in this constant, steady way and was a treat to my ears. I had spent the day at a friend's house watching her two children while she went to a doctor's appointment. To help her out a bit more, I then made dinner for her and her brood - her husband was out of town. It was a nice way to end the day and I was glad to help her out a bit. Anyway - on my way home from her house a light mist fell on my windshield and thunder and lightening livened up the sky. I was thrilled (we don't get much rain in Texas in the summer so any amount of precipitation is cause for excitement). I kept praying that the rain would reach our house and thirsty yard and not just play favorites by drenching my friend's neighborhood. My prayers were answered! As I pulled in my driveway the sprinkles started to fall once more. Nothing major but anything is a blessing! Because I was gone all day I spent about an hour doing those little things I needed to do - feed the cat, clean the litter box, check my email, tidy up the kitchen. I didn't notice if it was raining or not. Then, I heard it - the sound of water flowing through the gutters to the downspouts. The patter of raindrops on the roof. My heart beat a bit faster and I hurried to get ready for bed so I could relax to raindrops. One of my favorite things to do. It was bliss! The sound of the drops on the roof were lulling me into sleep. Nirvana! Sadly, the rain was over when I woke up (but it did keep the temperature in the 70's for my morning walk!) and the humidity was soaring. Such fleeting wonders are only appreciated more. Now I just have to decide if it rained enough to get me out of watering the lawn! Voice Update: My voice is certainly the worse for wear after a couple of days without exercises and headaches and stomach issues. I am missing a lot of sounds and it made it "fun" to deal with two young children yesterday. I know I was talking too loudly trying to be loud enough for the kiddos to hear me. All of the things I shouldn't do! When I talked to Hubby on the phone last night he commented that my voice was having some "problems." How nice of him to remind me! I guess this just goes to show me that I need to get back on the horse - so to speak - and buckle down to do my exercises! A quick note to ask you to head over to Coffee Bean's blog to watch two videos about dystonia. They are very moving and very informative. Spasmodic Dysphonia - what I have and what Coffee Bean has - is a localized form of dystonia. It is in the same family as the dystonia you see on the videos. We all need to help spread awareness about dystonia and encourage research to help find a cure for us all. Hubby and I have lived in our house for almost ten years now. We are the first owners and actually saw the place built from the ground up. I love this house. It isn't perfect but - it is ours. Shortly after we moved in we noticed a peculiar quirk of our house. We have a nice smoke alarm system which is hard wired into the house but which also requires batteries (back up I guess??). While we feel very secure that our house won't burst into flame without us noticing, there is that one quirk which sort of annoys us now and again. Last night - at three in the morning - this little quirk showed up again! I was blissfully sleeping away - thanks to a muscle relaxer taken to loosen up my tense muscles from the migraine a few days ago - and then it happened. A little electronic "chirp" started entering my dreams. This isn't a cute little sound. It is an annoying -so something about me NOW sound. Needless to say - I was soon wide awake. At first I thought the sound was our carbon monoxide detector resetting when the electricity goes off - or on. Even though we live in a city it seems like our power is always blipping off and then right back on and that darn monoxide detector is annoying with its chirps when the power is interrupted. Then, I realized that my ceiling fan was still whirring away so it couldn't be power outages. A couple of chirps later I had it pegged - it is that darn smoke detector. The detector right outside of our bedroom is the ONLY one which chirps like this on a regular (sort of) basis. Hubby dutifully changes out the batteries twice a year when the time changes and you would THINK that would satisfy the detector. Nope. I should tell you that this isn't the original detector which was at this location. That detector was basically blowing up batteries so we sent it back to the company and got a new detector. We thought all of the excess chirping would stop with the new detector. Wrong! Sure - the batteries are no longer messed up but the darn thing still chirps for new batteries. Like it chirped last night. At three in the morning! Knowing that I would never be able to sleep with that darn thing chirping away I lugged out the ladder, hunted down a battery, and changed out the battery. Problem solved. Then I went back to sleep for the couple of hours I had left before my alarm started chirping. Which is a whole different story! Voice Update: Well - once more I didn't do many exercises yesterday. I pretty much slept to get rid of my post-migraine hangover. I did wake up and continue on my exercise path in the afternoon though. My voice is doing okay. I still miss some of those darned unvoiced consonants but not as many as about a week ago. I did some reading out loud yesterday and it seemed pretty good. I just have to remember to talk quietly! Look at this wonderful Blog Award that Coffee Bean gave me! Thanks Coffee Bean! This makes me feel like I really am making a difference! On Saturday Hubby and I once more trekked to the Music Hall at Fair Park to see another musical in our series. This time it was High School Musical. 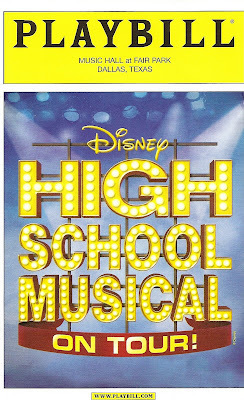 Yes, we went to see High School Musical. We have never seen the movie - yes, I know that is a horror of horrors. You see, we don't have any children so we miss out on so much! Anyway - there we were, adults in a sea of tweens and pre-tweens. We had alot of fun watching parents shuffle kiddos into the theater and we really had fun watching them line up to buy show merchandise. It was amazing how much stuff was being sold! T-shirts and notebooks and pens and purses and jackets and CDs (I will admit that I bought a CD - it is a tradition for me to buy a CD of the shows we see) and posters and pins and keychains . . . I could go on but, honestly, I can't remember what else they were selling. These things were flying off the shelves as parents purchased for their kiddos. I am going to pause here for just a moment to reflect on the marketing genius of that company called Disney. It really is amazing! Back to the show. So, there we were - Hubby and I - unprepared for what was waiting to unfold. Luckily the rather tall lady who normally sits in front of Hubby wasn't there and a shorter woman and her teenage daughter were there. This wasn't too much of an issue but one of them had on a LOT of perfume which helped to fuel the massive headache I ended up with by the final curtain calls. The show was cute. Very peppy with a lot of fast action and bright costumes. The whole story revolved around a pair of teens who were good singers and ended up auditioning for the school musical despite their other obligations. Of course they "liked" each other and ended up kissing - ohhhhhhh! Did I mention my headache? Well, unfortunately, the headache prevented me from truly appreciating the show. I did manage to think that the sets were pretty ingenious. They had reversible sets which rolled around. Some had lockers on the back and scenery for the theater classroom on the other. I couldn't figure out if they used the same rolling sets and changed the backing or if they had a ton of rolling sets. Again - I had a headache so I couldn't concentrate. If you have tween or pre-tween children I think this show would be great for you to see with them. I only ask one thing . . . don't let them rustle candy wrappers in the second act! It sounded like a million wrappers were being undone at the same time at the beginning of the second act! A very unusual sound in a theater! Voice Update: I was not feeling well this weekend and because of that didn't spend much time on my exercises. My voice is okay today but not at its best - probably due to a lack of exercising! I will get back on the horse - so to speak - once I finally kick this feeling bad stuff! *****Okay - I haven't been able to sleep again and my stomach is protesting something so I got up and started writing. Here is the first bit. It isn't clear from this section what is happening - exactly but I think I might be able to fall asleep now so I am going to try. Hopefully more of this story will come at later dates. And hopefully it won't be at six in the morning after I have been up for four hours! As the skeleton crew of the Control Room’s night shift quietly goes about its duties, he stands before the giant map, hands clasped loosely behind his back, feet firmly planted. His posture is deceptively relaxed as he studies the map displaying real time information from every sector. Red and blue dots course up and down large pathways and twist their way through smaller winding tracks which seem to meander without real direction. Numbers and codes constantly shift and change as new data arrives in the central Control Room and is transferred to the display. Each change is quickly noted by his sharp, gray eyes but his immobile face reveals no hint of their import or lack thereof. He simply stands and takes it all in. Gradually, a pale hint of dawn sweeps across the dual screens at the front of the Control Room. The weary night shift gives was to fresh faces as the morning shift takes their places in front of control panels, monitors, and keyboards. The quiet hush of the night are replaced with lively conversation and bursts of laughter as the workers greet each other and settle into their stations. Stretching subtly, Ralph slowly works the knots out of his muscles from the long night of sitting. 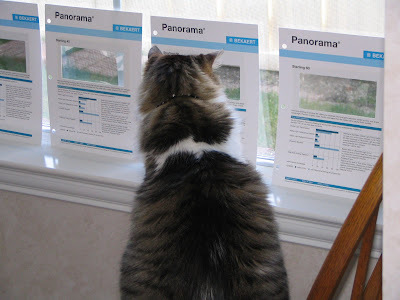 He looks at the man in front of the map who is still staring without moving. He pushes the envelope into Charlie’s hands and then flees. Ralph and Charlie share a chuckle before turning serious once more. They both look at the envelope and then to the Commander who is still in front of the map. Both men know that nothing good could come of whatever is in the envelope. Even as Ralph walks from the Control Room Charlie heads toward the map and the Commander. He notes that while the man appears relaxed at first glance, he is actually very tense. His jaw is clenched and his hands are balled into fists behind his back. A thin line of tension mars the smooth skin above his gray eyes and between the coal black eyebrows. “Yes, Commander,” comes the reply from a workstation across the room. Almost instantly a duo of green shapes flash onto the map tracing a downward path. The green shapes are in a collision course with a mass of black x’s grouped a bit further down on the same course. Now the Commander abandons his position in front of the map and begins pacing the length of the Control Room. Charlie stands at attention off to one side waiting for his next instruction. He knows it won’t be pleasant. Without waiting for her response, Charlie briskly walks out of the room after the Commander. While he looks calm, a cold sweat had broken out along his spine and the collar of his neat, blue uniform suddenly feels too small. Resisting the urge to run a finger along the inside of his collar, the aide knocks at the Commander’s door before entering the room. “Good, good,” the Commander says distractedly. He is shuffling notes on his desk adding quick comments here and there. He stops and looks up at his aide who is still standing in front of his desk. Cautiously Charlie sits in one of the deep leather chairs facing the Commander’s desk. He has been the Commander’s chief aide for more than twelve years and has become a close friend to the man. This isn’t the first time the Commander has invited him to sit. Nor is it the first time that the two men have talked as friends rather than as boss and employee. It is, however, the first time that they have talked about an upcoming event which might change their lives forever. Sort of a short post to tell you about this article about Robert Kennedy, Jr. This article addresses his SD and then goes on to explain a bit more about the disorder. I found it interesting! I normally have strange dreams. Very strange dreams. They are so common in my life that I usually just shrug when I wake up and go about my business. However, every once in a while there are dreams that are just so bizarre that they stick with me for a while. Like my dream about auditioning for American Idol. First of all, you should know that I have ABSOLUTELY no desire to audition for American Idol. I never have. Sure, I used to do the whole theater thing when I was younger but I realized early that I enjoyed being backstage much more than being out there in the spotlight. I love to sing - but normally in groups or in the shower. In fact, I don't sing in public any more. The whole SD thing really took that away from me. However, I do sing along to my iPod when I am home alone. But, I digress. In my dream Hubby and I were waiting (and waiting, and waiting, and waiting) for my audition for American Idol. We had gotten a letter (?!?) saying that we should show up in the morning so - there we were. We waiting for part of the time outside on a group of benches. We watched other people who were also waiting and even talked to some. They were an odd bunch, let me tell you! I really remember one girl who sat down between up and put her feet on Hubby's lap because she needed comforting after facing Simon in her audition! The nerve! Later we moved inside to a nice little lobby section. The whole time I was running through songs in my head trying to decide what to sing. There was a little message board on the wall next to us where other contestants wrote notes and things. I remember one note from a person named "Shmoo" telling Helen that she was a "lock." Somehow I also think I was knitting while I was sitting there. Not really sure. Apparently our seats were near the back entrance to the audition hall. Because it was warm in the hall the door was left open frequently. There were about a million people in there - okay, maybe not a MILLION but, there were a lot. There were the three judges and then a whole panel of stern looking people along the side who reminded me of the people waiting for the phones to ring at telethons. There was also a big table at the back where the two producers sat. These guys were right out of a magazine ad - they were gorgeous! Young GQ looking guys. They saw us out the door and let us come in and chat with them. It was almost lunchtime so we asked when I was scheduled to audition. The producers called over a cute young girl with a green clipboard who flipped through a mountain of paper and told me "2:30." What? I had been told the morning and it was going to be 2:30 before I auditioned? Why? She explained that some of the other auditioners were having a hard time taking no for an answer and were having to be dragged from the room. That apparently took a lot of time and was really messing up the schedule. After she left and the producers went out the door next to us to get some lunch, Hubby and I decided that we might as well get lunch too. We glanced out the door at the Burger King just across the surprisingly small parking lot. I was still trying to decide what to sing and if I should tell the judges that I have SD. ***Reality was beginning to sink into the dream - a sure sign that I am heading towards consciousness! As Hubby and I were discussing if the judges would be able to hear my SD influenced singing and if we should sneak out to get a burger and some fries, I woke up. 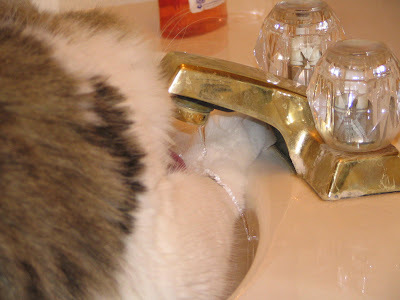 My kitty, Miss Cleo, was meowing in the bathroom - probably what woke me up. What in the world does this dream mean? I don't even watch American Idol and certainly have no desire to audition! I am not a masochist and I think I am too old anyway. I do remember asking the producers if I could get work as a producer - I would be good at that. Is this a sign that I should enter the world of musical production??? A sign that I want a hamburger and fries? A sign that my headache meds mess with my mind? Voice Update: Still trucking along with the exercises every thirty minutes. That darn timer is a bit annoying but it is getting so that even the cat doesn't jump when it goes off any more! I will admit that I didn't do as many exercises as I should have yesterday because I took a LONG nap in an effort to stem the headache (it didn't work). However, I did hang out in my bonus room and read while stopping to do exercises when the timer went off. I think I was up there for about two hours. 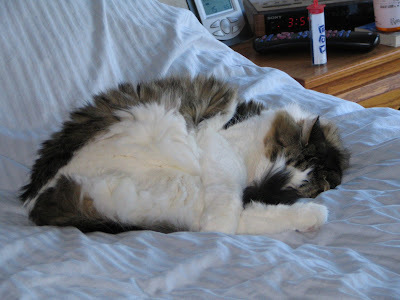 I then took some more meds and another short nap when Hubby came home. I did more exercises between dinner and walking but had a very bad attitude about them - it was the headache talking! Well - the bad news is that I have a killer headache and am still cranky. The good news is that I am getting a haircut today so maybe that will help things a bit. I love haircuts - especially the shampooing part of the whole deal. I am not too fond of the tiny pieces of hair flying up your nose part but . . . those are just the things one must deal with to be beautiful. I had speech on Wednesday and was told what I already knew - my voice was good but not as good as it has been before. I was given remedial voice exercises to do and a rigid schedule. Now I am doing inhale "e's" every thirty minutes. Not inhale/exhale - those are too "advanced" for what we are doing right now - just inhale. I do ten single "e's," ten double "e's," and ten triple "e's" with about thirty seconds of throat massage afterwards. All of this every thirty minutes. How time flies when you have a timer on. Oops. I haven't set the timer today. It must be the headache! The subject of throat massage came up at speech - okay - I asked how I should explain it to everyone - and my therapist and I had a nice little chat. She gave me some places to look online to get a better idea of how to explain things. Of course I haven't done the research yet - I am blaming the headache. Darn convenient excuse, don't you think? Anyway - I will get on that and get a post and a podcast ready for you on that topic - if you are interested. Yesterday was a lazy day. I decided to watch a movie I had Tivoed. It was Harry Potter and the Goblet of Fire. I have read all of the Harry Potter books - how could I not when I taught fifth grade during the time these books made their appearance? While some people don't like the books - I love them. They really appeal to my overactive imagination and I feel the movies are well done. Of course they don't have all the detail the books do but they are very respectable. Anyway - I was watching the movie. Harry had completed the first two tasks in the triwizard championship. He had just entered the maze for the last task and found Fleur being sucked into the shrubbery. That was a bit scary. I don't remember if she survived or not. And - what was going on with Krum? He looked a bit . . . "odd" while in the maze. Just as Harry was running from something which was coming . . . the video stopped. Just plain stopped. The little message popped up asking if I was done with the recording and wanted to delete it. Delete it? I wasn't done yet! I checked out the recording and found that for some inexplicable reason the last half hour or so of the movie hadn't recorded! Talk about a real downer! I will have to watch to see if it is shown again soon! I am sure it will. I hope it will! In the mean time I have decided to reread the whole series of Harry Potter books again to fill in the time until I can see the rest of the movie. Okay - here are some pictures that I pirated from my friend "Mo." You see, I went to her house last December to help her with a gingerbread house party for her Kindergarten aged son. It sounded like fun - and it was. Mo was a little over the top though. 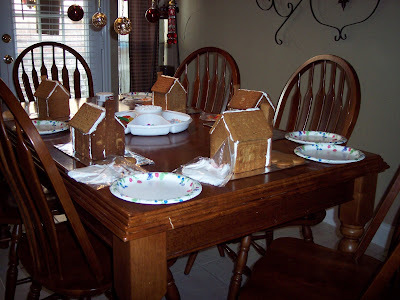 First of all - she made each of the houses from scratch using a Pampered Chef cookie mold. She made six little houses. They even had chimney pieces. She is just too ambitious. Did I mention that Mo also has a little one who was about a year old at this time? When did she find the time??? Anyway - Mo made the houses and the little Kindergartners descended upon them and proceeded to have a fun time. They used a lot of icing and all kinds of little candies. Look how intently Mo's young one is working! 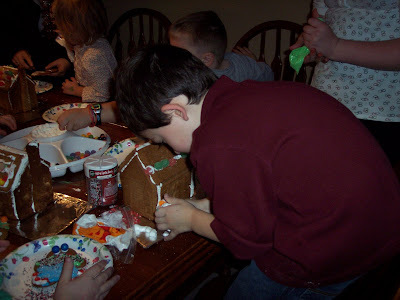 Of course, it seemed like most of the boys were having more fun decorating the yard around the houses than the houses themselves but . . . 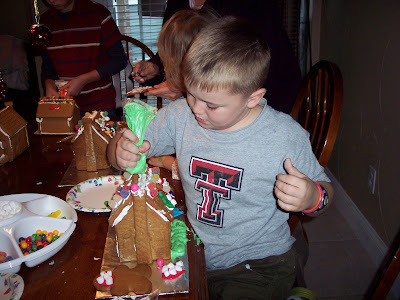 I have no idea who this little one is but look how nicely he is decorating his house! He really got into it. He didn't even eat any of the candies until towards the end of the decorating. Mo didn't get any pictures of the finished projects so I can't show them to you in all their glory but let me tell you - they were spectacular! It was a fun party. I just recommend that anyone trying this one yourself - go for the store bought houses! Voice Update: I have already told you about the exercises. My voice is getting stronger from the darn things so I can't complain too much. The cat is getting used to the weird "e" sounds and so is Hubby - again. I read out loud for about half an hour last night after we walked. I am still missing some unvoiced consonant sounds but my voice is getting stronger again. I just need to remember to lower the volume. The louder I try to be - the more strain I put on my voice. A couple of days ago Flea tagged me for this lovely Meme so - here it goes. . . I am supposed to ask a loved one to think of three random things about me. Well, I asked dear Hubby and the conversation was . . . interesting to say the least. Here is a synopsis. Me: I am supposed to ask someone to list three random things about me and guess what? You are that someone. Me: Just that you should tell me three random things about me. Me: I don't know - random things. Hubby: Can I say you're cranky? Hubby: Can I say stubborn? Hubby: Can I say smart? Hubby: Good. That is three. Hubby: (unintelligible grunt and three whacks on the mattress which is code for "I love you." I let him go to sleep then. So - there you have it. Three random things about me from a loved one: cranky, stubborn, and smart. I am not certain how I feel about those three particular things being what Hubby came up with. Maybe I need to start being a bit more loving! Or I need to ask him these things before 11:30 at night! Okay Flea - I did it! Now I am tagging a couple people. I am tagging Coffee Bean, Sara, and Lauren. Only three from me! Oh - I should remind people that for some reason you must say "Phtphtbt!" in the comment where you inform your "victims" that they have been tagged. Sounds like fun, huh? Cranky but with places to go, people to see. I am cranky. I woke up that way. Probably because I didn't sleep well. Again. You see, I have this problem sleeping. Well, not really a problem with sleeping - I can sleep with the best of them - rather, a problem with falling asleep. Falling asleep is something I do not excel in. At all. A normal night, a "good" night, consists of me lying in bed for a good hour and a half listening to Hubby snoring away before dropping into wonderful slumber. A bad night . . . well, it can take upwards of three hours for me to drop off. The big problem is that my brain won't stop. I am tired and yearn for sleep but my brain decides that I should spend the time pondering the great imponderables in my life. When am I going to get another job. Will I get another job? What was the name of that song I heard the other day? How could I cook things which I normally bake without using the oven and heating up the entire house? Would Hubby eat something I "baked" without using the oven? Do I need to clean out the fabric softener dispenser of my washing machine again (thanks to Coffee Bean for that thought!)? Shouldn't washing machines be self cleaning? How does fabric softener work? I need to get fabric for some hand warmers I am knitting for Christmas. I haven't knitted in a while. I should get that out again. I wonder if I have the right needles to knit those socks Aunt Donna sent the pattern for. Wasn't the cute nose warmer pattern I saw at the store made from a sock pattern? I wonder if anyone would actually use a nose warmer if I knitted them. Speaking of knitting, I need to fix my iPod cozy. Maybe it is time to buy a new cover for my iPod. Do I really want to spend money on that? Money. What was it that I wanted Hubby to buy for our anniversary? I know it cost something like $600. Now, what WAS it? And so on and so on and so on . . . .
You can see why sleep becomes an elusive goal. People have given me all kinds of hints for falling asleep. Stay up reading until you feel drowsy (I get so into the book I will stay up all night - even if the book is boring!). Get out of bed and do something different until you feel sleepy (this works - until I am in bed again and still can't fall asleep). Just tell yourself to fall asleep (!!!! If this worked for me sleeping wouldn't be an issue!). Drink warm milk (THAT just sounds disgusting!). Eat/don't eat right before bed (tried 'em both - nada). Take sleeping pills (okay - got some from Doc Feely and they help me fall asleep. However, I am awake again in about two hours and then can't fall back asleep. I also have a sleeping pill hangover in the morning. I use them as a last resort). This falling asleep problem is something that I remember having for a long, long time. It is all my darn mind's fault! My brother told me that he had similar problems but that they were solved when he started taking "happy pills." He said that he found himself having moments where he wasn't thinking of anything. Really? I have done the "happy pill" thing and have never had any moment where I wasn't thinking of SOMETHING. Huh. Are my pills not strong enough? I have no idea what the problem is (well, I know it is my brain but why - that is the question!) or what to do to solve it. So - until I figure something out I will continue to enjoy my quiet "thinking" time at night. Listening to Hubby snore. Wishing I was snoring too (not that I snore, of course!). Being cranky the next morning. P.S. What kind of spell check doesn't recognize the word iPod? Get with it Blogger! Voice Update: Pretty good. A bit "wunky" on those unvoiced consonants. Had a real time of it last night while walking with Hubby. He has allergies and his ears are blocked. I am not talking too loudly (as usual). He only hears every fourth of fifth word I say. He tells me that he only PAYS ATTENTION to those particular words (silly, silly man!). He keeps asking me to repeat things. When I repeat them, my voice is worse. I get frustrated so I don't talk for most of the walk. Hubby wants to know if I am upset. Ah - such is life with allergies and SD. I did my inhale/exhale stuff yesterday (while grocery shopping!) but didn't do the massage. Oops! Today I am finally writing the blog that I have been putting off for almost two weeks now. 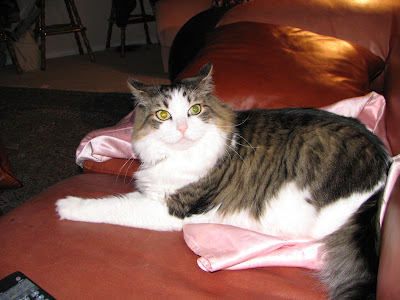 As you may know, Hubby and I took a two week cruise to Alaska recently and left our two babies (Q-Tip and Miss Cleo, our kitties) in the very competent hands of two wonderful people. Our neighbor was taking the first shift of cat sitting with a good friend of mine taking the last four days - when Neighbor's vacation overlapped ours. Both of these people have watched our kitties before with good results. 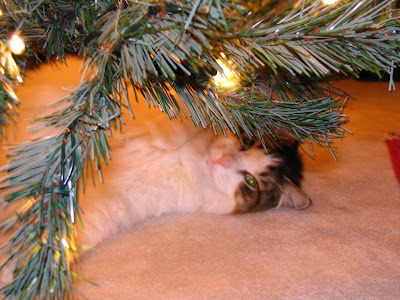 The cats have always been happy and healthy when we returned home. True, the cats didn't always make appearances for the cat sitters but, they always came out the other end none the worse for wear. This time, however, was a bit different. This time, our beloved little boy, Q-Tip, not only didn't make an appearance, he died. 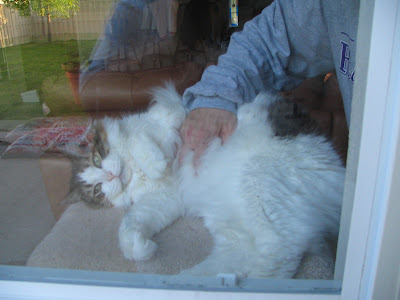 Neighbor was in charge at the time and when she didn't see Q-Tip she went looking - as always. Normally he hunkers under our bed so she looked there first. She saw something she thought was the cat but it didn't move so . . . she thought she must be mistaken and kept looking. After a thorough check of all the other hiding places, Neighbor returned again to the bed. This time she looked closer and yes, it was Q-Tip. And no, he wasn't moving. Being a real soft hearted woman, neighbor sort of freaked out. She waited until her husband came home and they investigated again. Yes, our little boy had passed away. Neighbor and her husband took care of things and took our baby to the vet's for safe keeping until we got home. They also emailed us to let us know what had happened. 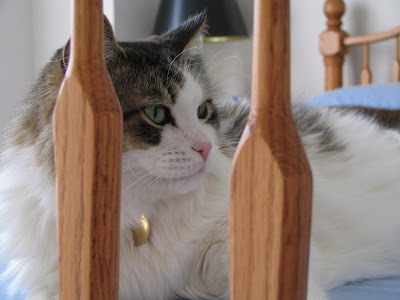 This was quite a shock to all of us as Q-Tip was only eight years old and in good health - as far as we knew. He had been to the vet not too long before our vacation and everything was fine. Hubby and I had a really, really bad night on the cruise after reading that email. We are still having some bad times but are slowly getting better. We are spending a lot of time with Miss Cleo, our remaining kitty, who is missing her brother too. 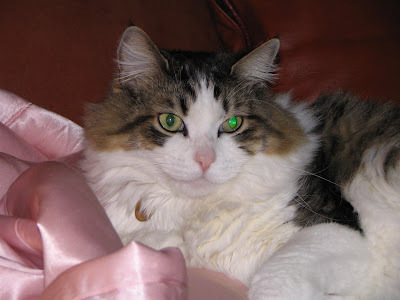 It is really sad to write about my baby and to remember that he isn't here. I still look around the house at times expecting to see him sitting there watching me. Yesterday I worked upstairs on my podcasts and missed Q-Tip intensely. Normally he would have been right there on the desk next to me the whole time with his fuzzy little belly and insanely long whiskers. We did talk to the vet when we returned from our cruise and he said that he wasn't sure what had happened. Nothing seemed wrong. He did say that it might have been heart problems. At least he assured us that Q-Tip didn't suffer and that he probably passed away quickly and quietly. As I type this I find my eyes tearing up as I remember how funny and sweet Q-Tip was. He was our "gentle giant" and we will always remember him. I just finished posting TWO new podcasts today. Yes, you read that correctly, TWO! The first podcast - episode #20 is about the amplified telephone which is invaluable to me as I go through my ABSD dance. I include information about how to obtain the telephone (applicable in Texas only, sorry!) as well as ideas about how to start the ball rolling to find such a phone if you live in other states. I hope to come back to this blog and show a picture of the phone in all its glory later today (after dinner!). Oh - Mom, this podcast is a long one! Sorry about that but there was just a lot of information to share. I think it is around ten minutes. You may want to start downloading before you walk and it might be ready when you get home! Here is a rather poorly lit photo of my wonderful phone. It looks a bit dowdy but, I don't really care! It helps me get heard! 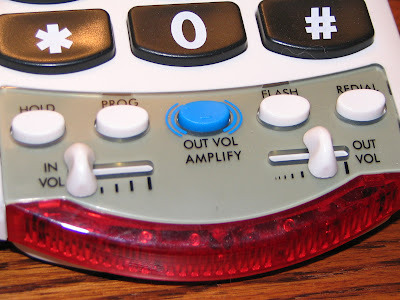 This is a close up of the amplification button. You can also adjust the volume of the outgoing voice. Since this is a phone will all kinds of wonders, I can also amplify the incoming sounds (good for talking to other SDers) and, if I wanted, I could install a battery so the bottom part would blink wildly when the phone rings. I guess I am ready for when I start losing my hearing too! This is also a good picture of the HUGE buttons on this phone. It makes me feel like I am about three years old and playing with the "grown up phone." I guess when my eyesight goes that will be a good thing, right? The second podcast is a short one - only about three minutes - and it is all about getting the word out about the video about SD from the Denver television station. Isn't the sky just so blue in this picture? I love it! 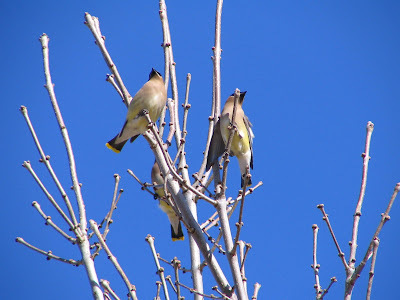 These are Cedar Waxwings - I do believe - hanging out in our trees out front in early spring/late winter. Hubby isn't feeling well today - allergies, I think. We are just hanging out at home and doing a whole lot of nothing. Maybe I will actually get around to editing and posting another podcast - wouldn't that be super? Voice Update: Haven't talked a whole lot today since Hubby is still sort of out of it but, it seems like my voice is good. Still missing some of those darn "h's" but . . . I am starting to like the world without them! I did a lot more massage yesterday than I have been doing and I think things are really starting to loosen up. I also annoyed Hubby to death with the inhale/exhale matching pitches while we were watching tv. It was a boring program anyway! I hope everyone had a nice Fourth of July and got to see a few fireworks. Hubby and I always get to watch fireworks while standing on our front sidewalk. It is nice and we don't have to fight crowds for a "good" spot. Time for some more Alaskan pictures. Don't worry - I think I am almost done. Again -if you don't want to see more pictures - just skip today. 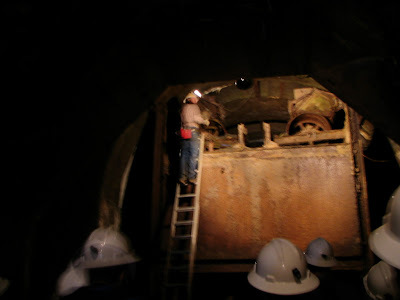 However, I am going to show some gold mine pictures so you might want to stick around! 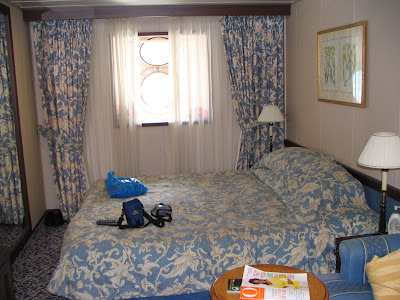 I have shown you our stateroom before with its porthole. 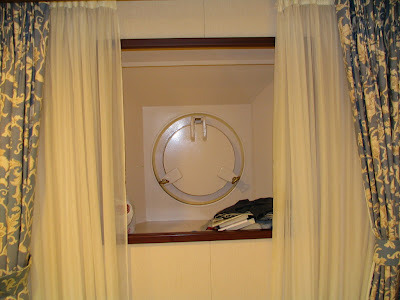 Well, for most of the trip the porthole was open like this letting that midnight sun shine in. We had to really make sure the curtains were closed when we went to bed or we would wake up at about five in the morning when the sun "rose." What fun! Now, here is a shot of the porthole closed! On a sea day, in the afternoon, our room steward came in and shut the porthole "by orders of the captain." Interesting! Of course Hubby and I wanted to know what was up. Apparently there was some rough weather coming. Hubby and I got up from our mid-afternoon nap (aren't vacations great?? ), bundled up, grabbed our earmuffs and promptly headed to the top deck where the jogging track was (deck ten) to see what was happening with the weather. The wind was blowing so hard that it was difficult to walk against it and when you walked with your back to it, it blew so hard that you had to sort of trot along or get blown down. Also, the water was really rough. At one point we had to stop walking in order to avoid getting drenched when a wave crashed over the rail. Remember - we were on the 10th deck of the ship - pretty high up! That was some wave! Needless to say, many people were a bit "under the weather" that night. The dining room was less than half full and even some of the wait staff were conspicuously absent. When we were in our room we could hear the waves crashing against the side of the ship seemingly right outside our safely closed porthole. Luckily, neither Hubby nor I get motion sickness so we rode out the rough weather with no problems. 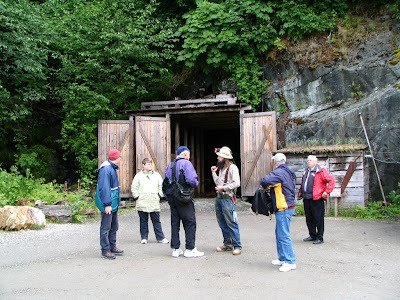 When we were in Juneau we took a Gold Mine tour. Here is the resident miner (who was actually a retired miner from Arizona who lives at this mine during the summer to lead tours), Dave, is showing us the mechanism for directing ore onto conveyor belts to be sent to processing. Notice all of the hard hats. We had to wear these nifty hardhats to go into the mine. Only Dave's had a lamp on it. Hubby felt jipped. 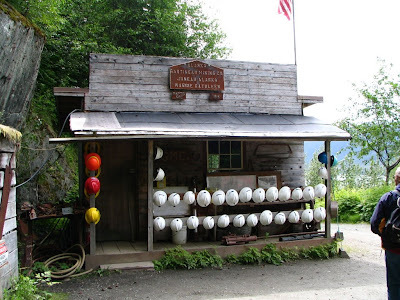 Right outside the mine entrance was this little shack with the hardhats just waiting for us. Here we are mobbing Dave asking all kinds of weird questions. That is me in the green coat. Because I had a massive headache at the beginning of this day, Hubby was in charge of the pictures. I am happy to say that the cold, dark mine helped my headache pretty much go away. Now, if only I had a cold, dark mine in my back yard for every time I got a headache! 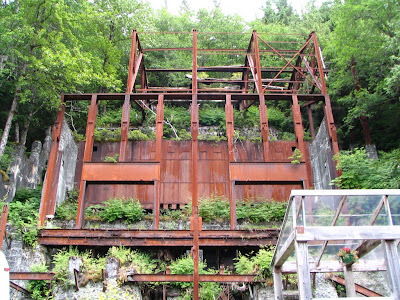 This is all that remained of the old ore processing factory. All of this steel and the concrete for the foundation had to be lugged up the mountain - we were pretty far up there! Notice the glass structure in the foreground - well, plexiglass - that was built for all of us tourists and was nice and heated! After the official tour, we got to pan for gold in a little station set up near the gift shop. Both Hubby and I found gold (!!!!) which probably amounts to 1/100 of an ounce and is worth something like sixteen cents. I guess we will have to find another way to get rich! Panning for gold was fun! 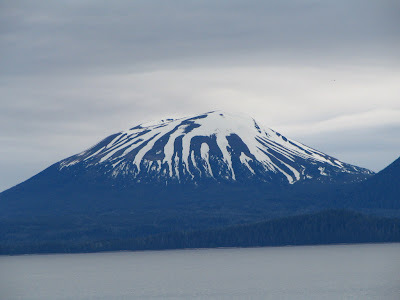 These next pictures are from our "Sea Otter and Wildlife Tour" that we took in Sitka. We traveled in a nice boat which had an enclosed section on the first deck which was heated and also had a small snack bar. The top deck had some enclosed seating and also an open air area. We spent most of our time in the open air section. Freezing! We did see some interesting creatures though. Here is a Sea Otter. 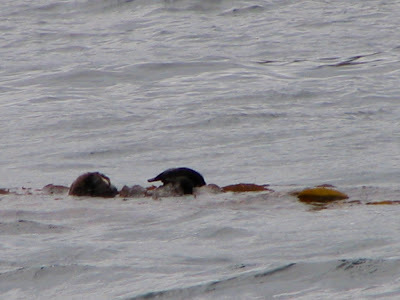 Hard to take good pictures when the boat is bobbing up and down and the Sea Otters and bobbing up and down. Trust me - that is an otter. The zoom on my camera wasn't nearly as good as the zoom on my binoculars! 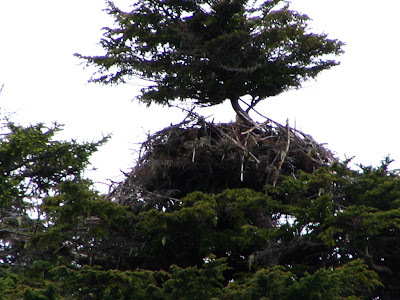 This is an eagle's nest. Supposedly, people saw a little head bobbing up and down in this thing. I never saw that at all! The nest is HUGE. Quite impressive. There was an adult hanging around the nest but I didn't get him/her in this shot. Hubby was enthralled with this volcano. I can't remember its name but, it certainly was nice to look at! Here is my best shot of a whale. 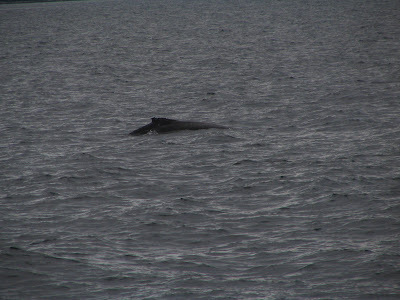 This is the humpback which was flinging its tail around earlier and stopped just as I got ready to take the picture. This whale was further out of the water but, again, I just couldn't get the picture! It became a joke to everyone on the top deck that I couldn't get a whale picture. Nice. A grey whale also surfaced very close to the boat but, I didn't get any picture of that either! It was pretty awesome to see in person though. To think that we were on the water and these huge mammals were under the water where we couldn't see them. Well, that is the last of the pictures from Alaska. I hope you enjoyed them! I know that I had a lot of fun taking them! I guess I will have to go back to my "normal" blog now. How boring! Hey - does anyone out there reading this know how to make the text in a blog look like it has been crossed out? If so - please let me know! Voice Update: Pretty good. Not the best, of course, because I need to build up the effects of my exercises. My throat is still pretty tight when I do the massage and it is even crunchier sounding - I hate that sound! Inhale/exhale matching pitches kept me company while I was reading yesterday. I didn't read out loud - totally forgot! Darn! Well, I will have to work on that today. OOPS! This is really KODIAK!